Sure, I’ve shot down a few artists (if you can call them that) recently, now I thought I’d share the work of some of the ones I like. Let’s face it, I like painters, or people who deal with imagery in a sophisticated way. And I probably like conceptual art as much as most of those who profess to admire it – my own background is in conceptual art – but it’s just not my cup of tea. Just like I like Oolong, but I’m really a black tea with milk and sugar kind of a guy. So, let me kick this off with Eric Joyner. Eric Joyner, Along the Mysty Path. Just a Sunday afternoon on Doughnut Planet. Gotta love the swirly doughnut frosting, the sprinkles, and the balance of vibrant colors. Has a doughnut wrapper ever been painted better? Joyner is a bit of an artist’s artist. One can delect upon the classic handling of paint alone. When there are clouds in his paintings, they are worth looking at in and of themselves, just for the blending of colors and brush strokes. His subject is comical in a fresh way. Joyner was an illustrator, but then decided to become a fine artist. What to paint? He decided to paint what he loves. I think he was very honest in his choices: doughnuts and 50’s toy, Japanese robots. Then he combined the two, and with his treatment of depicting them, which makes their scale heroic, and the atmosphere vibrant, a new world is formed. Eric Joyner, Dark Rider. I modeled the pile of doughnuts in my current image (Human Fly) after these. Well, I made them first, but looked at these to improve my technique. 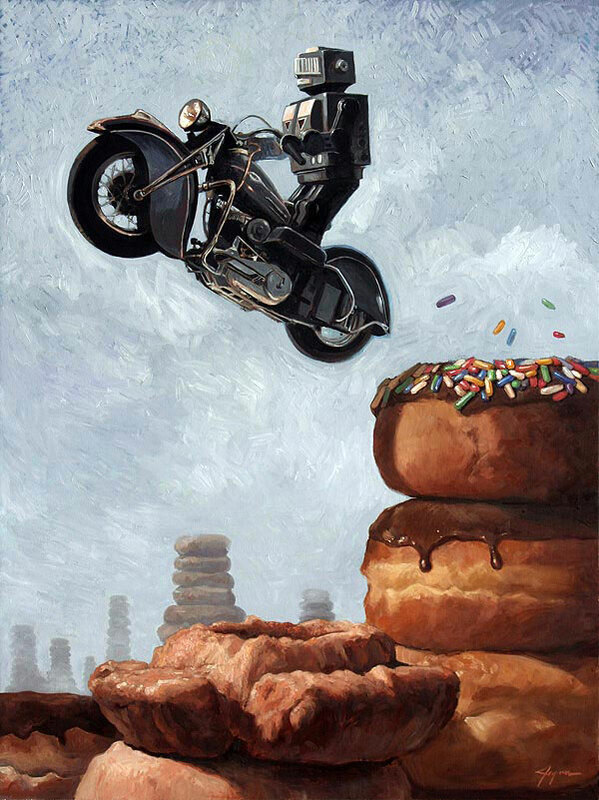 I like best the paintings that are just the robots and doughnuts, in a universe of their own. Sometimes there are people, or references to movies like Apocalypse Now or Star Trek, but I’m not as interested in the plot or narrative. People might be requesting that he make a Robot Elvis, or something along those lines. I’d rather he didn’t. Another way to put is that I don’t so much want to see his robots and doughnuts in my world, or nostalgic 1950’s America, as I want to visit the Robot/Doughnut planet (which implies all that other stuff anyway). Eric Joyner, Sweet Budhha. Doughnuts, clouds, toy robots… and a Buddha. Part of the appeal of Joyner’s work, for me, is just his technique of modeling form in space. His subjects are molded, shaded, reflected upon, and textured. Anything he paints in this style will have a semblance of the real, even if the content is decidedly fictitious. He is playing with the building blocks of visual reality to compose his own world. This is something artists simply are not trained to do anymore, and a most enviable skill. It’s also something I’m working on right now, while I’m putting my “Human Fly” in color. If I had Joyner’s painterly skill, the process would be going a lot faster. Instead I’m doing a lot of experimenting and trial and error to find and realize the effect I want. The Human Fly (In Progress). This one’s by me, and I’m really struggling right now with the color. I could go with dim colors, and that would make it easier. But I want to balance more striking color. I’ve got a ways to go, including more trial and error. Eric Joyner, Close Call. Captures a 50’s Americana feel without being too explicit. Notice how many different colors are in the cliff in the painting above. It ain’t just brown. Also all the colors on the door of the car, the shadow, highlight, reflected color. This style isn’t easy. It’s like a language you learn through practice. Eric Joyner, The Giant Slayer. Nice glaze. Above is a kid’s playing-with-toys world writ large. Eric Joyner, The Final Blow. You’ve probably seen this one before. The Rock’em Sock’em robots are on a poster on the back of the door in Sheldon and Leonard’s living room in the TV series, Big Bang Theory. This one really encapsulates the element of making a childhood game into an adult reality. * See my finished Human Fly here. 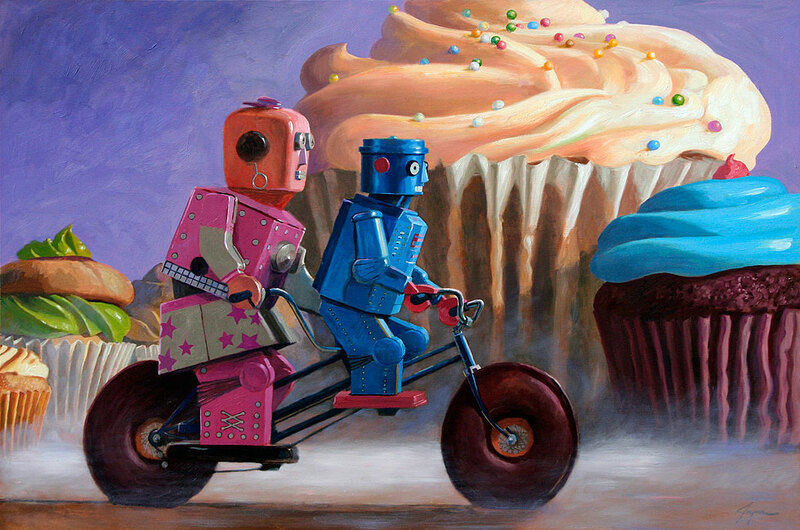 Posted in art criticismTagged art, contemporary art, doughnuts, Eric Joyner, illustration, painting, robots, sci-fiBookmark the permalink. Love getting my dose of art history and contemporary art, along with following an up and coming artist like yourself, all in one blog! 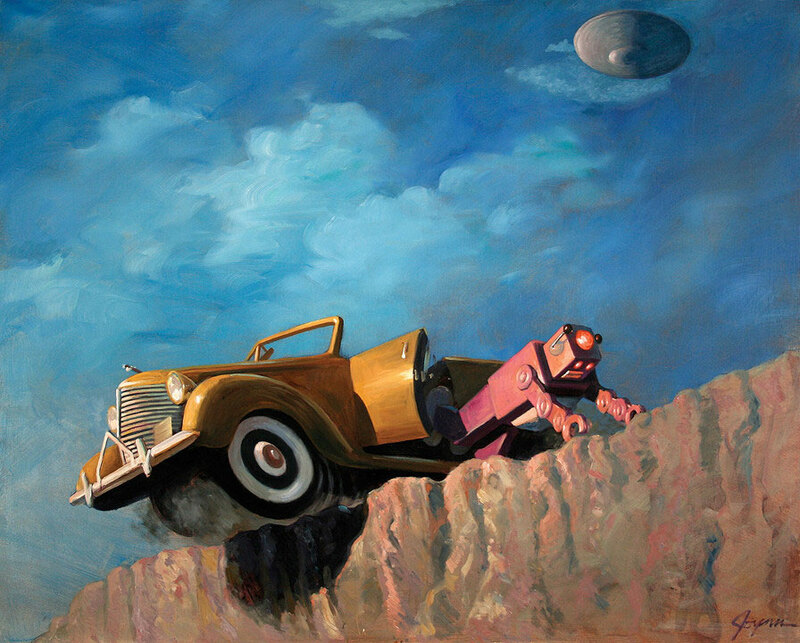 Joyner is whimsical, talented and now I want one of his paintings…you chose great ones. I like them all. But if I had to choose…Buddha. Love those clouds 🙂 and well, it’s weird. Good Choice. So appropriate for Thailand, and I doubt anyone would take offense. The robot seeker. Cool! Thanks for posting this artist. I’ll check him out.